On Saturday, October 29, 1960, 14 year old Lloyd paid the higher ticket price for a Reserve Seat to the 2 PM Matinee of the "Roadshow" engagement of John Wayne's "The Alamo". The picture was playing in Los Angeles at the Carthay Circle Theater in "Todd A-O" and this was it's first Saturday performance. Roadshow films in the Los Angeles area normally had an 8 PM evening showing with a 2 PM matinee on Wednesdays, Saturdays and Sundays only. This was because of the length of these motion picture's which were divided into two parts with a 15 minute Intermission between them. 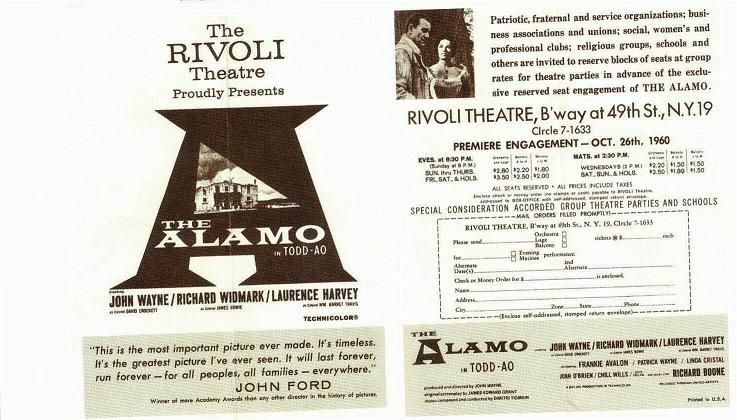 The same criteria applied to the "Rivoli" Theater, in New York City, where "The Alamo" premiered the same week. Below is a picture of the advance ticket order form for "The Alamo" at the "Rivoli". Note that matinee performances for this reserved seat feature had ticket prices ranging from $1.50 to $2.50. While night performances ran between $1.80 and $3.50. Just for reference the average price of an Adult Movie Ticket for a Double Bill at a local movie house was 69 cents in 1960. Oh, that $3.50 Reserve Seat ticket would equal $28.00 as of this writing due to inflation. The Carthay Circle Theater was one of the grand movie palaces in Los Angeles. It was opened in 1926, located at 6316 San Vicente Boulevard, in what was then known as the Carthay district near Beverly Hills. The theater was on two floors with balcony seating, restrooms and concession stands on both levels. I say "was", because in 1969 a Developer purchased the building and tore it down. Earlier in the decade of the 1960's Sid Grauman's Chinese Theater, built in 1926, with its famous hand prints of movie stars outside. Along with his Egyptian Theater, built earlier in 1922, with its ancient Egypt facade and walkway. Where both gutted and turned into multiplex theaters by their new owners forever altering their internal grandeur. Only the Pantages Theater now remains in Los Angeles, untouched, as a legitimate theater reflecting the glamour of old Hollywood. Among many Hollywood productions the Carthay Circle Theater saw were the world premiers of two Walt Disney animated classics "Snow White and the Seven Dwarfs" in 1937 and "Fantasia" in 1940. In 1939 "Gone With the Wind" had it's West Coast Premiere there and the theater would be used for that movies first revival. Giant floodlights crossed the sky every night as Hollywood's best went to the movies at the Carthay Circle in a world I remember that is now long gone. It was here that I saw the 1955 movie adaptation of Rodgers and Hammerstein's "Oklahoma" in Todd A-O,. A year later.in 1956 Michael Todd's production of Jules Verne's "Around the World in 80 Days", also in Todd A-O, played at the theater with those floodlights scanning the night sky. The Carthay had a curtain covering the screen and Todd had images suggestive of scenes in his movie imprinted on it. When I sat in the theater to watch "The Alamo" those images, four years later, remained and would be there at the movie palace's death in 1969. The theater for it's 43 years of existence was a Los Angeles landmark known around the world and John Wayne choose it for that reason and the splendor within. As was done with the image of the landmark Los Angeles Pan Pacific Auditorium turned into the entrance to Walt Disney Resort's "California Adventure". 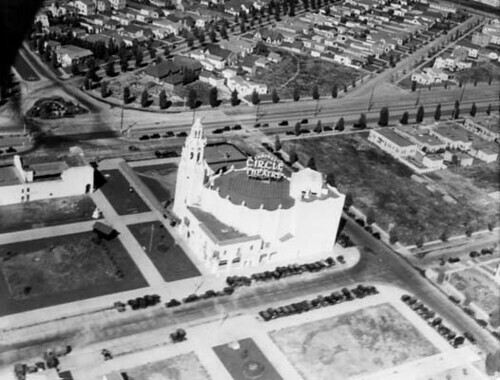 My reader can see a replica of the exterior of the Carthay Circle Theater in the same West Coast park. Simply it was competition to Cinerama. Without the need of using three cameras to film the picture and three projectors, with visible lines on the screen, to watch the picture. The name came from Michael Todd and his partner the American Optical Company. The process used 65 mm film stock and then reprinted the negative image onto 70 mm film stock, but at five film stock perforations higher. Which gave the film a taller aspect ratio than either standard 35 mm stock, or pictures released in CinemaScope. Below is an image from the Cinerama production "How the West Was Won". Note the two lines caused by the meeting of the three projections. Below is a Todd A.O. image from "Around the World in 80 Days". Note the lack of lines as there is only one projector, but the range for the eye remains the same. Both processes used a curved screen, The closest film process at the time of this writing to Todd A.O. is IMAX., but it does not use as wide a screen size. First Impressions of "The Alamo"
As I said I had purchased my ticket for the 2 PM matinee and entered the theater lobby. Before I reached the concession stand an employee was selling the official souvenir program for a dollar. Sounds inexpensive, but adjust a dollar for inflation and that's eight dollars and five cents today. Wish I still had that program. I found my reserved seat and sat down. The lights started to dim as I stared at those "Around the World in 80 Days" curtains. The overture to "The Alamo" began and the curtain started moving and was completely open as the titles on the picture began to roll. I watched Richard Boone as General Sam Houston and his men arrive in San Antonio de Bejar. Where he finds out that Richard Widmark's Colonel Jim Bowie is drunk having won a battle the night before. As a result Houston raises Laurence Harvey's William Barrett Travis to the rank of Colonel and appoints him to command the defense against Generalissimo Antonio Miguel Lopez de Santa Anna. Houston leaves and Bowie and Travis have a confrontation. The film then cuts to two riders on a hill overlooking San Antonio. I recognized character actor Hank Warden as "Parson". Warden had been in Howard Hawks's "Red River" and John Ford's "The Searchers", but it was the person with him that caused my first strange reaction to the picture. I'm sorry, but when I saw 20 year old Frankie Avalon, who played Smitty, in that somewhat black coonskin cap. 14 year old Lloyd had the impression that at any moment he would start singing "Venus", or another of his hit songs. During the birthday sequence he would sing. Next a riding group lead by John Wayne enters the picture and not having seen 1939's "Allegheny Uprising" with Wayne. I was taken back by the "Davy Crockett Coonskin Cap" on his head. Besides the fact that it seemed not to fit him in several scenes. To me John Wayne didn't look like John Wayne. My image, besides his war movies, was as Hondo Lane in "HONDO", or as Ethan Edwards in John Ford's "The Searchers". Besides, thank you Walt Disney, everyone of my generation knew Davy Crockett looked like Fess Parker. Those immediate impressions disappeared after I saw both actors in the cantina sequence. Below Fess Parker in Walt Disney's "Davy Crockett, King of the Wild Frontier"
Republic Picture's "The Last Command" focused on the story of Jim Bowie and those 13 days at the mission turned fort called "The Alamo". It wasn't the first film about the events. That was the silent picture "The Immortal Alamo" made in 1911 running 10 minutes in length. Actually there were seven movies made prior to Republic's tale, but the Republic picture's history is important to anyone who wants to know about John Wayne's epic released only five years later. I don't remember if I was wearing my "Official" Davy Crockett coonskin cap, not real coonskin of course, to see the picture, but I am sure other boys did. The central character of Jim Bowie was played by actor Sterling Hayden. William Barrett Travis was portrayed by Richard Carlson, whom I associated at the time with the television series "I Led Three Lives" and the two science fiction films "The Creature from the Black Lagoon" and "It Came from Outer Space" both in 3-D. While Davy Crockett was played by character actor Arthur Hunnicutt. Below Sterling Hayden as Jim Bowie and Arthur Hunnictt as Davy Crockett. Hunnicutt's Crockett with that beard and weather worn appearance was in stark contgrast to Fess Parker's television character, which at times was slightly unshaven, and especially John Wayne's clean cut Crockett. Hunnicutt, who many fans of director Howard Hawks and Wayne might remember from "El Dorado", portrayed a more believable backwoods man than the other two actors. Below Richard Carlson as William Barrett Travis. "The Last Command", is only nine minutes longer than the halfway point of the roadshow cut of John Wayne's "The Alamo", but it covers the same events. That is the problem with any film about "The Alamo". Those events never change, but the perspective of the producer and director does. A known fact was that John Wayne wanted to make a motion picture about the Alamo as far back as 1945, but was faced with a contract with the creator of Republic Pictures Herbert Yates. Wayne was his major star and Yates dangled the Alamo picture over the actor to keep him in line and probably never planned to make such an expensive picture in the first place. Especially as John Wayne really did not want to act in it, but just produce and direct the feature instead. In Herbert Yates' mind a film directed by John Wayne was not a film with John Wayne and, therefore, unprofitable to his studio. In 1952 the actor's contract was up for renewal and Wayne did not renew it, but formed a production company with Robert Fellows. Wayne-Fellows would eventually become BATJAC Productions. However, a film about the Alamo was on the back burner at the time, but the two men would make instead "Big Jim McLain" in 1952, the 3-D film "Hondo" in 1953, in the same year "Island in the Sky" and in 1954 "The High and the Mighty". All with Wayne along with other non-John Wayne motion pictures. When I first saw the Roadshow version of "The Alamo" one character and the way she was presented stood out to me. I had the impression I had seen something similar before and then I thought of "The Last Command". In "The Alamo" Davy Crockett meets a young Mexican widow named Graciela Carmela Maria "Flaca" de Lopez y Vejar. The role was played by Linda Cristal and a romance develops between the young lady and Crockett. In the story Davy Crockett is concerned for her safety as Santa Anna approaches. In "The Last Command" Jim Bowie meets a young Mexican women named Consuelo de Quesada. The role was played by Anna Maria Alberghetti and a romance develops between the young lady and Bowie. In the story Jim Bowie is concerned for her safety as Santa Anna approaches. Yes the background of the two ladies is different, but the closeness of the twin stories is very coincidental. 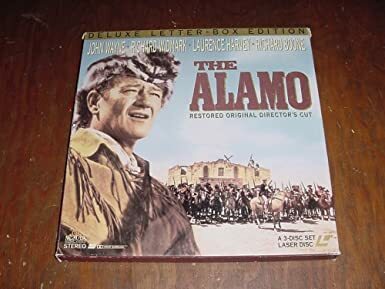 My reader should know that John Wayne and screenplay writer James Edward Grant were originally working on his Alamo script for Republic Pictures prior to his parting with the studio. The script would remain with Herbert Yates, because of Wayne's contract. It would be rewritten for the 1955 "The Last Command" by Warren Duff from a story, partially based upon the Wayne/Grant screenplay, by Sy Bartlett. A viewer of both features could just substitute Davy Crockett''s name for Jim Bowie's name, or vice versa in many of the situations. Although in "The Last Command" the only real difference in story concept was having Bowie and Santa Anna have been friends, because of Bowie's marriage to a Mexican women. As I said before the historical facts of the battle of the Alamo must remain unchanged. So the way the major known participants are presented is up to the screenplay writer and the extant of fiction wanted. Anyone who sees both films will find other similarities between them, besides the platonic love stories. Another example concerns Davy Crockett's death. In both films Crockett takes a lighted torch and places it on dynamite blowing himself and some of Santa Anna's troops up. Whereas Walt Disney on February 23, 1955 had Fess Parker swinging "Old Betsy" at Santa Anna's troops. As Davy Crockett remains the lone defender left alive at the Alamo and the story just fades to black. A very heroic, if very fictional ending for the television mini-series..
Another reason for the similarities between the two major motion pictures is that the screenplay writer for John Wayne's 1960 motion picture remained his friend James Edward Grant. Grant has sole writing credit for the production. Going back to Walt Disney's version of the Alamo. There was one character in that segment I always liked played by actor Hans Conreid. This was the gambler "Thimblerig who joins Davy Crockett and Georgie Russell to meet their deaths at the mission turned fortress. I found it interesting that as part of Crockett's group in John Wayne's movie was Denver Pyle portraying a character also called "Thimblerig". Shell game. The shell game (also known as Thimblerig, Three shells and a pea, the old army game) is portrayed as a gambling game, but in reality, when a wager for money is made, it is almost always a confidence trick used to perpetrate fraud. While we do not see Denver Pyle's "Thimblerig" play the "Shell Game". We do see Hans Conreid perform it multiple times in the mini-series. Below Hans Conreid as "Thimblerig"
Below Denver Pyle as "Thimblerig"
So was there a man called "Thimblerig" with Davy Crockett who died at the Alamo? By that name apparently not. Perhaps one, or more of the above names were professional gamblers who used the shell game and maybe not. We will never know as I attempted to see if I could put a real name to this created character. As for the characters in John Wayne's epic. It should be noted, as many already know, that he did not want to play a part, but wanted to just direct. He did consider the small role of Sam Houston, but his financial backers thought like Herbert Yates. There could not be a John Wayne movie without John Wayne in more than two, or three small sequences. So Wayne eventually gave in and become Davy Crockett. One has to wonder what the film would have looked like had John Wayne only directed as he wanted too. I personally thought he should have been Jim Bowie as it fit his persona better in my mind. 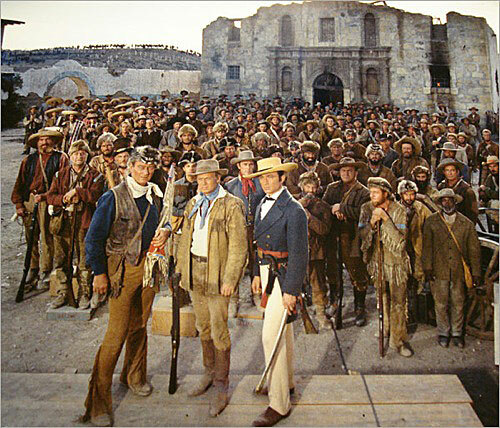 It wasn't long after the roadshow version of "The Alamo" closed at the Carthay Circle Theater that I, like many who had never seen it that way, were in our local theaters seeing the General Release. It was obviously cut down to permit more showings in a day. Thereby, creating more profit for both Batjac and United Artists. That was the way of things at the time. To illustrate here are three other roadshow movies changed for General audience release. The 1958 motion picture version of Rodgers and Hammerstein's stage musical "South Pacific" was cut from 172 minutes to 157. The 1966 motion picture version of James Michener's classic novel "Hawaii" was cut from 189 minutes to 161 and 1969's "Krakatoa East of Java" was cut from only 137 minutes to a renamed "Volcano" at 101 minutes. It should be noted at this point that John Wayne wasn't unfamiliar with the studios requiring the editing of a feature's length for General Release to obtain larger profits. Wayne and director John Huston had traveled to Japan to film the story of the first American Counsel General Townsend Harris. Huston presented 20th Century Fox with his cut of the motion picture and was ordered to edited it down. 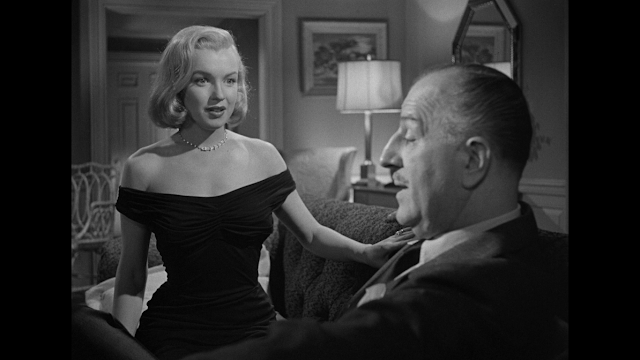 As the running time of the picture director John Huston wanted released would require an intermission and the studio wanted profits over content. Houston refused to cut what was a dream film of his and the studio took over. What was released as "The Barbarian and the Geisha" ran only 105 minutes. In my opinion the studio's action was responsible for the negative reviews of John Wayne's performance and the obvious inconsistencies with some of the scenes to the previous ones shown. I have to admit laughing at some of the comments I've read, or have heard about the missing footage to "The Alamo". This footage seems to have brought, in some sense, the Roadshow version of John Wayne's epic picture to mythic status, There are fans who have, from their comments, the Laser Disk release of the Roadshow version of Wayne's picture and have been writing negative reviews for the General Release DVD. These reviewers are telling possible purchasers not to buy it and just "wait" until the Roadshow cut just materializes on DVD, or BluRay at some unspecified time. Although there are people attempting to get funds to restore the picture I enjoyed back in October 1960. It is also fact that the only known copy of the complete film was found in 1970 deteriorated and unable to be restored. My advise to my readers is enjoy the General Release version as it was edited by John Wayne himself. Although some Rare Film Sites will make a DVD-R copy of the Laser disk should you be inclined. Addition to my original article: Turner Classic Movies has run the complete Roadshow version twice to my knowledge in 2017. Where their copy has come from I could not determine. The real questions here are how long was the Roadshow version of "The Alamo" and how much time was removed by John Wayne for General release? I have read and again heard fans state unequivocally that almost one full hour of the picture was missing from the General Release version. That amount would definitely add to what I call the "mythic status" of Wayne's epic. The one constant here is the running time for the General Release is 167 minutes. Which in itself is a long motion picture to sit through without an "Intermission" and that is one magic word. Santa Anna came prancing on a horse that was black as the night. In the feature film Santa Anna rode a beautiful snow white stallion. but what does this have to do with that missing footage? Had you called either the Carthay Circle Theater, or the Rivoli for the running time of "The Alamo", You would have been told a time that ran from the start of the Overture to the end of the Exit Music. So it would include the 15 minute Intermission period and that time was published in the local Los Angeles and New York newspaper movie sections. That total time would have been incorrect, but is important for the confusion over the Roadshow engagements actual length. On April 10, 2010 in an article looking at Wayne's motion picture 50 years after it premiered. The website for "True West" Magazine wrote that his Roadshow feature ran 192 minutes. That was also incorrect and misleading, but made sense in how they looked at the film. "True West Magazine" was looking at the actual running time of the Roadshow version from the opening credits to the fade to black after the closing credits. Based upon their figure of 192 minutes minus 167 minutes for the General release. The missing footage is only 25 minutes which is less than half of that "mythic" one hour. What about the running time given to the newspapers and callers of the two theaters showing the Roadshow engagement? As I stated that figure "included" the 15 minute Intermission. When I called the Cathay Circle Theater to have an idea when I would get out from the matinee showing. I was told 5:37 PM. As the movie started at 2 PM. This meant the performance was Three Hours and 37 minutes in length, or 217 minutes. Subtract 167 minutes for the General Release version of "The Alamo" and the Roadshow is now 50 minutes longer. This is as close as one will get to that missing hour of footage and is the source for the confusion. Now subtract 15 minutes for the Intermission and the actual running time of the Roadshow version is 202 minutes, or Three hours and 22 minutes in length. The actual running time. What "True West Magazine" and many reviewers forget is that the total time for the Roadshow engagement of any motion picture includes the Overture, Entr Acte and Exit music. All of which was removed from the General Release cut of "The Alamo" and runs approximately 10 minutes. Thus giving the magazine it's running time of 192 minutes. So what was the other 25 minutes removed by John Wayne? That would be the birthday party for Lisa the daughter of Captain Dickinson and his wife. That sequence includes the song "Tennessee Babe (Oh, Lisa)" which runs two minutes and thirty-three seconds. When you look at what was actually edited out of the Roadshow engagement for the General Release version. It makes perfect sense for time constraints as not one of the critical battle sequences were touched, or the character development and relationships touched. However, it raised a question that contributed to the legend of major editing to the original picture. When Santa Anna arrives with the main body of his troops and gives those defending the Alamo an hour to remove their women and children to safety. We see Lisa and a little boy wearing birthday party hats. Where did those party hats come from? 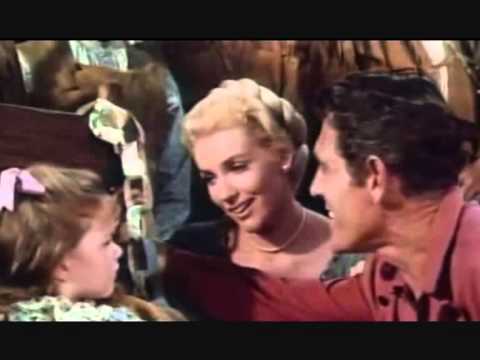 Below Ken Curtis and Joan O'Brien singing to Aissa Wayne, John's daughter, the song "Tennessee Babe". There's a website that lists 34 mistakes made in John Wayne's movie. The major one to me is that the final battle is during the day. When it was at night and by daylight all the defenders were dead, but then it is hard to see a night battle. This is the West, sir, When the legend becomes fact, print the legend. The story of the Alamo is legendary and has been told many ways. In the early 1970's my wife was sent to a seminar in San Antonio from her work. I went along and spent the time she was in classes visiting the Alamo and the many tourist versions of the battle. I saw the monuments to the defenders and other related sites. John Wayne's film tells the legend and in grand scale as any story about it should.